In this one year, I have come a long way since my dreamy self boarded that flight. I developed a love-hate relationship with Delhi, travelled to countless small villages & towns, marvelling at the natural beauty India is adorned with, and let the stark reality of social issues in India dawn on me. In my first few months, I lived with purpose, preaching the spectrum between optimism and idealism to everyone I knew, including myself. I refused to accept that anything was impossible to change, especially mindsets. I tried to fight head on the inefficiencies in the ‘system’. Sometimes I gave up, but mostly I escaped into the wilderness that can be found beyond any Indian city. 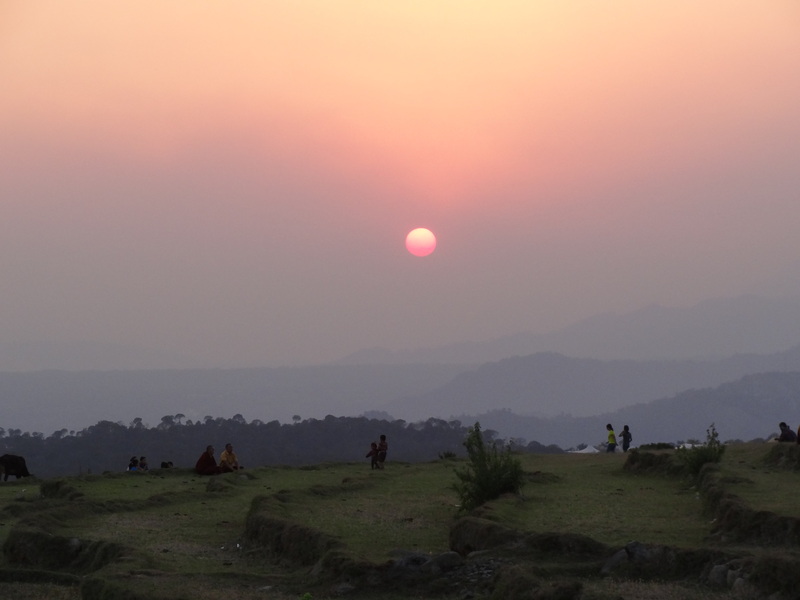 I rejuvenated amid the magnificence of the Himalayas and the Shivaliks. I rejoiced in the warmth of the people I met on the countryside. 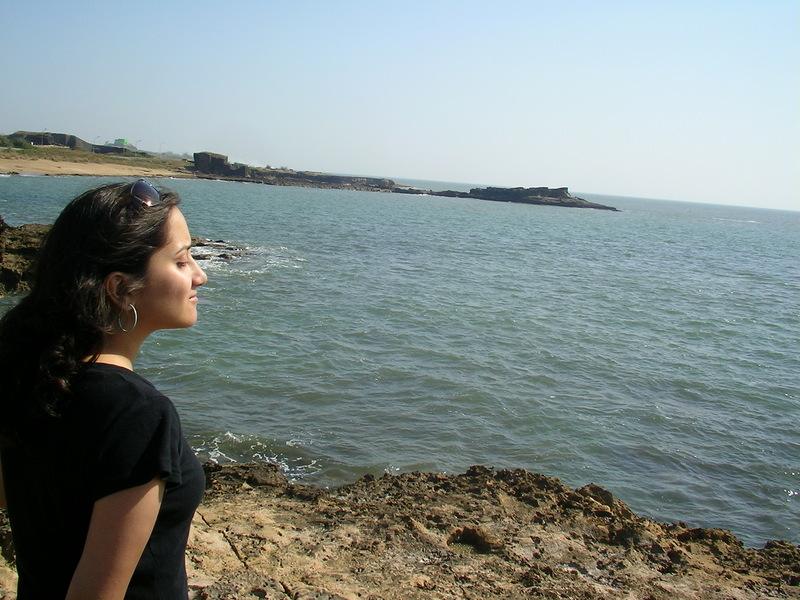 I gathered myself on the shores of the Arabian Sea. Letting my hair down by the Arabian Sea in Diu. I didn’t know then, that in the coming months, I would slowly trash my conviction and accept that I can’t be the change I want to see in this country, the country I loved to bits. I slowly started to understand that it is not easy to live in a country plagued by poverty and homelessness, after experiencing life in a better part of the world. How do you go about your life – eat at a fancy restaurant, spend a fortune on a fancy hotel, shop at a mall, do anything really – when there is someone who, by mere fate, is sleeping on the streets and begging for his next meal? This maybe exactly how a westerner feels in India, and it makes me wonder how so many of us Indians can suppress, or even eliminate, the contradiction of our everyday lives. There are many ways to look at it, say that everyone’s trying to make the best of their lives with what they have. Or that our only responsibility is to be a law abiding, tax-paying citizen. Or worse still, that the government and everything else under the sun is to blame. Or simply that this is how it is, and what can anyone do. India is struggling with a billion other issues to which the same questions & arguments apply. How can one, with any basic human tenets, accept it and live with it, I don’t know. How can one get out there and change it, I don’t know either. I always thought I was one of those people who could adapt to life under any circumstances, water or no water, cleanliness or no cleanliness, comfort or no comfort. If one year in India of doing what I do has taught me anything about myself, it is that I am not one of those people. With a sinking self-esteem, I confess that I want and need my urban comforts. To those who can do without them, I say kudos, especially those who come to India after growing up in the west, and live a bare minimum life to follow their heart’s conviction. The road that leads somewhere, hopefully! Time & again in this one year, I’ve floated the idea of leaving Delhi, and leaving India, to live in another part of the world. Maybe it’s the restless wanderer in me that craves change. Maybe it’s because no logic justifies living in a city / country where I instinctively grab my pepper spray after dark. I know that running away is not the answer. But I don’t know what is. I agree with George Moore and its been my experience too … I came back and found my home. Glad I did it. Each one has to find his/her own home .. here or not here. And in the end do not regret for it was your decision. I think that’s the biggest dilemma Chetan. 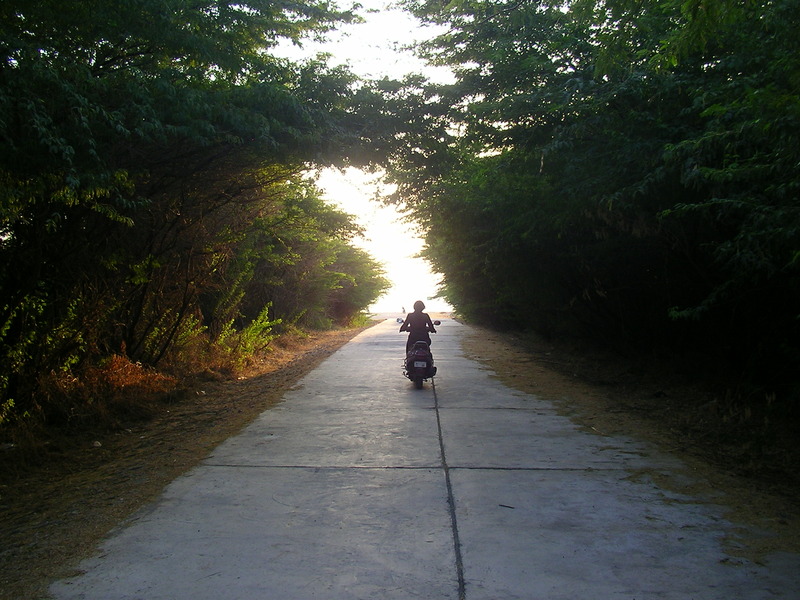 Wherever I live, I think my conscious will always be very aware of what I’m leaving behind in India. whats cooking? u r speaking in past tense! I understand your dilemma. I loved my trip to India to attend the wedding of our lovely friends. Everybody we met was delightful, friendly, inquisitive and happy to have us at their celebration. But, India made me feel so guilty….how could I just fly home and resume my life of (relative) luxury, while so many people had such dreadful lives….and how could they be so nice to us when some of them had so little???? It is a very confronting country for people who have affluent lives. I came home and sponsored a little girl in India…such a small thing, but hopefully better than nothing. I’m glad you did that, Debra. Living in India, so many of us learn to turn a blind eye to everything that goes on beyond our lives. I don’t know what’s more alarming, our inequality or our apathy. @justanotherwakeupcall …i can understand your pain but I am still hopeful we can bring that much needed change , we need to keep the spirits high and work together with the conviction that someday we will breathe in India we always dream about. You’re right Rohit, we really do need to keep the hope & conviction alive. It’s the only way ahead. Thanks for a word of encouragement! true Rohit 🙂 we cant let this dream die!!! It does, especially considering that we technically ‘celebrate’ our freedom today. Sigh. But kudos to you for not taking that easier route of packing your bags & leaving. I think I’ll give in to that temptation sooner than later. Somehow the contrast in Bombay is evident much more in Delhi. A friend of mine just recently made an observation that Bombay is probably the only place where morning walkers / joggers don’t look towards the sea, because that’s where the fishermen slums are. That’s our answer, if you don’t acknowledge it, it doesn’t exist. U hv been an inspiration so far. I hope this is one passing bout of depression/pessimism. And that u will figure out your way out of it. U r a brave girl. I m double ur age n still ispired by u.
Wud b nice to meet u. I m on gurgaon. Thanks Raji, I sure hope it will pass! It is so refreshing to see someone being so honest! I used to get bogged down by everything earlier (and still do!). The garbage on the road, the streetlights on at 11 am, the contrast between my ‘cushioned’ life as compared to those who make up the majority of India, the corruption (oh I’m sure you could add to the list). I’d complain I couldn’t change anything, this is how it IS. And then a friend told me it’s better to take baby steps than trying to change everything all at once. And that is something I live by now. At least the milk man next door has stopped using plastic bags. And look at you, through India Untravelled, you’re doing your bit. Small, yes, but definitely not insignificant. I think you don’t ‘belong’ to a country. A country’s essence contributes to yours. So no matter how far my travels have taken me, and however bright the colours there may be, India pulls me back each time. I’m really humbled to read this post Shivya. As long as India has people like you, we have hope 🙂 Chin up! “I think you don’t ‘belong’ to a country. A country’s essence contributes to yours. So no matter how far my travels have taken me, and however bright the colours there may be, India pulls me back each time.” I think I shall find it true for myself even if I choose to move away for a while. And you’re right. We’ve got to do the little things we can. It’s true for everything out there in the world. I totally understand your feelings.I personally feel that I can put up with bad roads,garbage etc..though my blood boils when I see them.But the greatest problem for me in India,is the issue of safety for women.In event of a crime,the female is judged and even ‘blamed’ for the crime.I just want to walk in the streets and feel I am a person,and not get reminded every instant that I am a female. I hear you, Vandhana. Like you said, this is no country for women. Sad but true. I am sure You have endless places to explore in india. Very Inspiring! All the very best for your future endeavours! A few days down the line, I will be echoing your exact same sentiments. I moved back to India from the U.S utterly because I wanted to and not because of any other factor. WIth much patriotism and idealism on the endless possibilities that seemed to be, everything seemed to be gung-ho from the other side. A few months down the line, although the optimism remains, the stark disparities and the problems that ail even day today life are cutting into the initial enthusiasm and stubborn belief that things will improve. I know I am happier here, but the mind wanders back to thinking, did I make a mistake?Did I really want to move to a country where roads are horrible, infrastructure is laughable, basic manners are missing and where there is such a general apathy towards everything? If you do head back, I ld totally understand and not lament the loss of one more brain like I might have done just a year back! And besides, I am sure the wanderer in you won’t let you stay in one place for more than a period of time! Good luck with where ever destiny takes you! Thanks Richa, in a strange way, it helps to know that I’m not the only feeling less optimistic now more than ever. I hope it’s a passing phase, and I hope you don’t get to where I am anytime soon. I think it’s to do with the inflated expectations I had, the thought that India is the greatest country in the world, which in some ways it is and in many ways it is not. I feel like Frodo too! There is a strange comfort in knowing that I’m not the only one feeling this way. The glass is half full, or did someone drink your half glass? If any country has better infrastructure or better mannerism or higher safety for lives, don’t they have higher tax rates, colour discrimination, or any morality? Every country has it’s characteristic flaws, nowhere it’s is as perfect as the myriad of culturally rich country we call home. I do sincerely respect your travel endeavours, and look up to your experiences. Someone drank half my glass of exactly those thoughts. Hoping to refill it again soon! People in the US and UK and for that matter all of rich Europe, might have had the same feelings say 150 years ago. There was crime and corruption, oligarchies and nepotism just like we have in India..but some good people made some good institutions and things have changed in those countries…Our generation would probably be the one which can usher in and see that very change occur in our country. So rather than being pessimistic we should think of ways to be good citizens, help our countrymen, save resources and help build a country we would be proud of giving away to our posterity. Jai Hind! Shivya, there are bound to be times when this country gets you down, especially when the contrasts are all around and our options are limited and often frustrating. But I think it takes real grit to stick with it and try our level best to change things around us. We cannot of course change the entire country or improve everybody’s lives, but look at the possibilities to do that here! Even if you reach out to only a few people and change their lives, you make such a difference! Which other country can afford you that? You have the opportunity to be a change-maker with your rural travel initiatives that can impact so many lives. Perhaps its time to chin up and take charge? YOU certainly can be the change you want to see around you! My heart is wth you in this dilemma. Our nationalities are different and we are experiencing different cultures (I am US and living in Mexico), but the common goal is to discover who we really are and how do we fit into the rest of the world. I have been reading (a lot on) your blog since yesterday night. And am feeling very thankful for Sapna’s blog, ‘Just another wake-up call’ for giving a link to yours in her recent post. Good luck and keep up this blog wherever you go! Previous PostMost Memorable Travel Adventures + Travel Books Giveaway! Next PostTurkey’s Black Sea Coast: A Photo Essay.